Sara and I may or may not have shared the story about how this blog came to be, but if we have, it was a long time ago and I’m sure there are some of you who haven’t heard the story. My husband and I got married as broker-than-broke college students, so the summer after we got married, we went to Seattle, his hometown, so he could paint houses and we could save up some cash. The whole time we were there, I kept hearing about this magical Sara who went to church with my husband’s family, only she was living in Brazil at the time. Well, fast-forward a few years when my husband’s little brother was dating Magical Sara, only she was doing an internship in California. I still hadn’t met her, but after a long weekend with my brother-in-law, I felt like I did because he literally did not stop talking about her the whole time. Well, Sara and my brother-in-law broke up and married other people and I didn’t really hear about Magical Sara for awhile. A few years later, when my oldest was a few months old, I started posting occasionally on a mommy message board. There was a girl there who had pretty much the exact same taste in recipes that I did; we even had nearly identical recipes that we had each made up. Well, one day we started chatting a little and I realized she was Magical Sara (and she realized who I was; there was no one-way stalking here, although I will say that my internet stalking skills are exceptional). Over the course of a few years, we became good friends and recipe buddies and bam, a blog was born. I’m just glad it ended up being her and not some creeper with a taste for lime and garlic. Anyway, the reason why I’m telling you all this story is because there are so many times when we each work on a recipe, post it on the calendar that we share, and realize that we have something nearly identical due to post within a week. Our brain-sharing is a gift. And a curse. Take, for instance, Sara’s Baked Chicken Penne that she posted a few months ago. That recipe and this one were scheduled to post within literally one week of each other. They’re different enough to stand alone as their own recipes, but still, I didn’t think y’all needed 2 baked chicken Alfredo dishes in a 7-day period, you know? One really great thing about this dish is that you can use up a whole bunch of leftovers all at once. 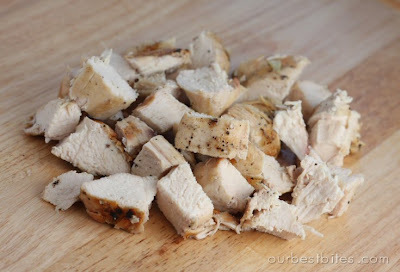 Leftover grilled chicken? Made too much bacon (hey, it could happen!)? Have some cheese leftover from pizza night? Bought one of those double-packs of green onions at Walmart and the rest are about to go bad? You’re taken care of! But if you don’t have all that stuff, just marinate some chicken breasts in a little Italian dressing for a few hours before grilling it, heat up your oven for some bacon, and you’re good to go. My other favorite thing about this is that it can be made ahead of time and either refrigerated or frozen until you’re ready to serve it. If you don’t plan on eating it immediately, cover tightly with plastic wrap and aluminum foil. If you cook it from the refrigerator, preheat oven to 400 and bake for 45 minutes or until cheese is melted and bubbly and the pasta is heated through. If you’re cooking it from the freezer, bake at 400 for about 90 minutes. Prepare pasta according to package directions. While pasta is cooking, prepare Guiltless Alfredo sauce. When pasta is done, drain and add to the sauce. 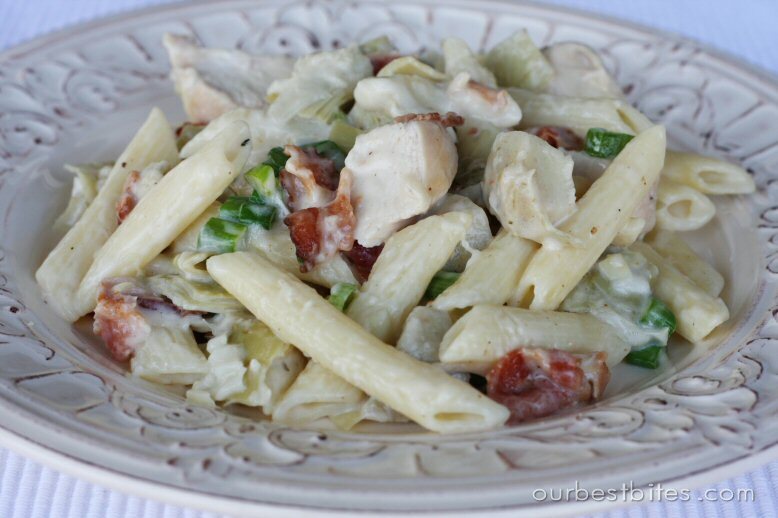 Toss with chopped chicken, bacon, artichoke hearts, green onions, and 1/2 c. mozzarella. Season to taste. Transfer mixture to an 8×8″ baking dish and sprinkle with remaining 1/2 c. mozzarella cheese. Cover with aluminum foil and bake at 350 for 20 minutes or until heated through and cheese is bubbly. Serve with a green salad and breadsticks or a loaf of garlic bread made with Garlic Bread Seasoning. My son's favorite pasta is one slathered with alfredo sauce. I can't imagine how much he'd like it with bacon too! This looks so yummy…I love how you don't have to use any condensed soups or jarred sauces (if you choose)! Haha, I'm liking the "Magical Sara" nickname. I think I might have people start calling me that, lol. My family loved this pasta- and with cheese and bacon my kids didn't even notice things like onions and artichokes. It was so so yummy! Have you tried freezing this one? 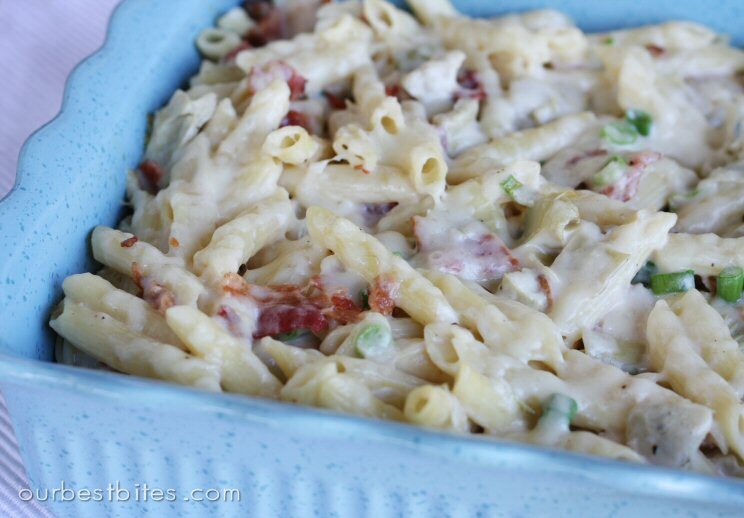 I don't know why I've never thought of Alfredo and Bacon before… sounds delicious! I found your blog 3 days ago and have been completely hooked since! Pudding pop, mini pies, easy pesto, I think I'm in love. My kids will definitely like this! They love chicken a lot! Love the story, this dish sound yummy and I really don't think it is possible to make too much bacon, but it was a cute joke . . This sounds delish and I think my picky son would eat it too. I made this on Friday and it was an instant hit!! Thanks for the great recipe. But I do have to say that in all of my 45 years, 38 of them spent cooking, I have never ONCE had any leftover bacon! i made this pasta this weekend for my family and it was amazing! a huge hit! and even better the second day! yummy leftovers! i love so many recipes on this blog and all of them always turn out fabulous! hugs! I made this Monday since I had chicken in the freezer, green onions in the fridge that I didn't really know what to do with and leftover bacon from Sunday morning breakfast. It was the perfect recipe to use up all those things in one shot AND it was a HUGE hit! This will definitely go into regular rotation at my house! Thanks for sharing this awesome recipe! 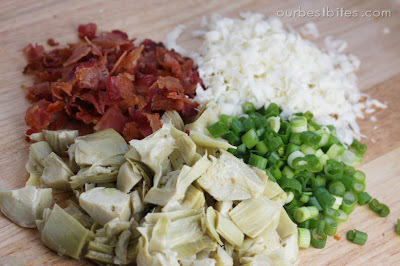 I prefer plain artichoke hearts, can I use those or do i need the flavor from the marinade? Wow! This could be one of my favorites from your website (and I have made a lot of them)!!! We really enjoyed it! I did use marinated artichoke hearts like you suggested. Thanks for all the great recipes! Sara, this recipe looks great and right up my alley because I can make it ahead of time for a dinner I want to have since I am a beginner cook 🙂 How should I season when you say: Season to taste. I don't want to over do it or have it bland, what should I use and which amount?? Thanks! E- that just means season with salt and pepper to taste. Just add a little and taste and if it needs more, add more! How much you add depends on your personal preference. my family and i really liked this a lot. very easy to make, and lots of leftovers – very filling. i added creole instead of the salt and pepper to taste and it brought out all the right flavors. Made this GF (gluten-free) and it was a hit with everyone, not just my GF husband. I used potato flour in the sauce and GF noodles. Best recipe I've tried lately! "My other favorite thing about this is that it can be made ahead of time and either refrigerated or frozen until you're ready to serve it. If you don't plan on eating it immediately, cover tightly with plastic wrap and aluminum foil. If you cook it from the refrigerator, preheat oven to 400 and bake for 45 minutes or until cheese is melted and bubbly and the pasta is heated through. If you're cooking it from the freezer, bake at 400 for about 90 minutes." Delish! Made it with intentions of putting it in the freezer for a rainy day… and it didn't make it past dinner time. My husband and daughter gobbled it up. good work! How many people will this recipe feed? I want to make this for a crowd (65 people) on Monday. Just wondering how many times I should x's the recipe to make enough? Thanks! My whole family loves this recipe! Great job! thanks for the fantastic, healthy recipe! if i have it in the fridge first for a few hours, should i cook it for the 40 minutes covered with foil or uncovered? thanks!! So yummy! I can't wait to try that. Hope calories don't count if you close your eyes! This was amazing! I didn’t have artichoke so I used some sundried tomatoes instead. So good and the best part is my kids loved it too. Thank you! I never like to alter your recipes because I think you do such an awesome job combining all the flavors, but I had a bunch of stuff in my fridge I needed to use up. SO I did a few swap-outs on some ingredients and made a dish I could make ahead to serve to company and it was a complete success. Of course I also made your rosemary focaccia to go along with. Great, prep-ahead dinner!! Thanks … again, for being amazing!! Made this for dinner tonight and it was soo good! The whole fam liked it. Not too hard to put together, either; I assembled it in the afternoon and my husband put it in the oven while I was away- all ready to eat when I got home! I love this recipe. So I wanted to make this for dinner but already had pasta for lunch. I decided to use all your same ingredients and made it into a pizza and followed your grilled pizza tutorial. I am the biggest fan of grilled pizza now. Esp. bacon, chicken, artichoke, alfredo pizza. You girls are amazing. It was so delicious!!! Great twist on a classic baked alredo!!! So good!! A friend made this without bacon and chicken tonight for my vegetarian self and it was delicious and very flavorful as a vegetarian recipe!! genius. loved it. I ended up not doing any chicken- would have taken me too long- added some diced pepperoni, diced tomato and red onion, and omitted the artichoke hearts (dont normally have those) and it was so good. i’m definitely doing this again, and this is totally an easy recipe to increase or decrease! loved it. Posted a vegetarian version of this today. It is really good, even without the meat! Thanks for the recipe! This was excellent! It made two wonderful meals! Thank you so much! My kids and husband loved this and I like the fact that you can hide other veggies in this. Loving your website with all of the great recipes. I don’t usually leave comments, but this recipe was fabulous! Our whole family loved it. Thanks for a great low-fat alfredo sauce too! I made this last night and my 2 year old ate 4 helpings I was shocked! It was great and defidently a repeat in our house. Thanks Sara! What’s the serving recommendation on this recipe, and have you ever tried tomatoes with it? So excited to have found this site. Thank you! I’m not an experienced cook. Can you tell me where to find how many people this recipe will feed? Thank you again! I am on spring break so I’m cooking one of your recipes each night! Hooray for being a stay at home mom (of dogs) for a week. 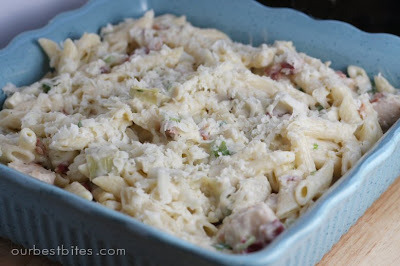 I have this in the oven now, and already ate about a serving before I put it in there. Oops. So many times I see a recipe that calls for marinated artichokes when what they really mean is artichokes packed in water (or frozen ones), not in a marinade. Is that what you intended? Just didn’t want that oil and vinegar taste if it’s not supposed to be there. Thanks! Yum!! Thanks for such a good recipe! I needed something I could make really quick, and this one caught my eye. I skipped the chicken and just used jarred alfredo sauce, but it was still really good and I’ll definitely make it again! I LOVE this recipe and love to make it when I have company. I also love the guiltless alfredo sauce and use it all the time for other recipes as well. Can you fix the link to the guiltless alfredo sauce on this page? Thanks! Hi Kate, This looks delicious and I want to try it, but I do have a question. Is there anything I can use in place of the marinated artichokes? Or will it be ok to just leave them out (we don’t like them). Thanks for any help you can give me. Have a Blessed Day.